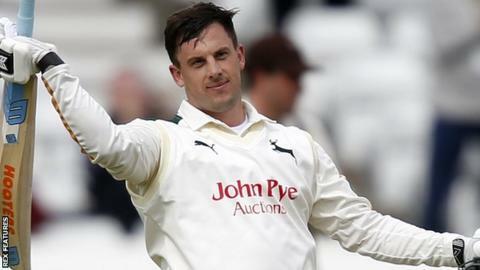 Nottinghamshire piled up 446 on the opening day of the 2016 season as Steven Mullaney punished newly-promoted Surrey with an impressive hundred. Mullaney (113), aided by a century stand from Riki Wessels (81) and Samit Patel (85) helped Notts beyond 300, before Chris Read added an unbeaten 63. Surrey's Tom Curran took three wickets, while West Indies paceman Ravi Rampaul (5-93) saw off Notts' lower order. At the close, Surrey were 7-0, having survived two overs unscathed. Surrey, who took the option to bowl first without a toss, removed Greg Smith and Michael Lumb before lunch, but could not halt Mullaney until he had guided Notts past 200. The hosts, who picked up maximum batting bonus points, looked like posting a huge total until Wessels was caught behind by Ben Foakes off Rampaul to leave Notts 308-5. Surrey will resume on Monday with openers Rory Burns and Arun Harinath looking to give them a foothold in the match.